Industry Awards... are normally awarded to a person for exceeding a quality standard but in our case, it is about the person (or people), the product (our car) and the presentation (which requires knowledge). Click Here to see ProTeam's impressive and ever-growing long list of industry awards! We love to hear from our customers and we especially love to hear great news. Don recently won Best of Show and we'd like to share his joy in his own words. From his email: "Dear Friends...got a surprise tonight at a Gahanna Car Show. 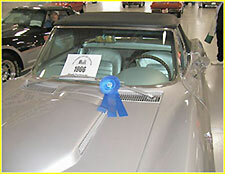 Out of about 140 cars I got the 'Best of Show' and it was presented to me by the Mayor of Gahanna." Congratulations but just one question, how'd you get the trophy home? Since buying the Corvette last November from ProTeam, it has won many car show trophies for first place in its class, one Best Paint award, and three Best of Show awards. On Saturday, April 4th, he drove the car to Austin for a NCRS Texas Chapter meet where it was awarded Top Flight. He is "very proud of my Blue Rosette" and looks forward to the Texas Regional Flight Judging in October." 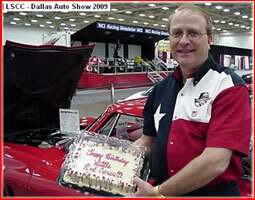 The photo is of Clark holding the car's 44th birthday cake on February 18th. 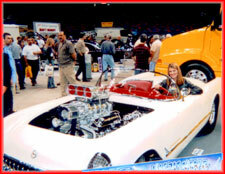 The photo was taken at the Dallas Auto Show (new car dealer show) in a Lone Star Corvette Club display. 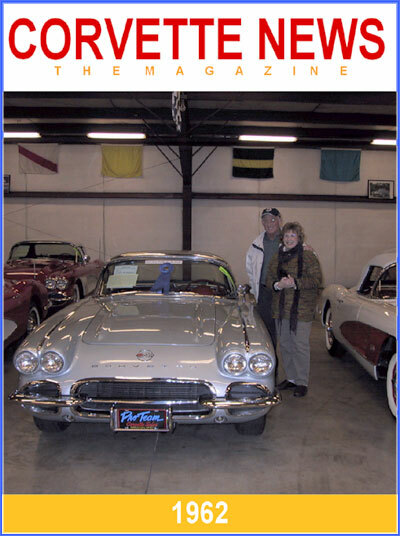 Jeff and his wife purchased the Silver Fox earlier this year from ProTeam and it appears that Jeff has caught the same Corvette fever afflicting the entire Corvette hobby. He says, "The car is beautiful, and we are definitely enjoying the rumble of the car." We consider it a most wonderful curse of ground thumping porportions. Thomas Hiloski and his lovely bride took delivery of this 1967 Corvette convertible on a beauty of a summer day in Ohio. The warm Texas sun will shine a little brighter when the Hiloski's cruise the roads that run through Flower Mound, Texas. The Maxson's waste no time posing for their first official family portrait with their "new" classic Corvette outside of ProTeam Corvette in Napoleon, Ohio. May not be an award winner this sunny afternoon but it certainly is a head turner! 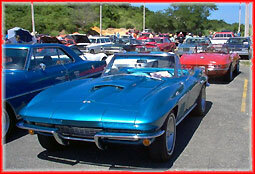 This postcard was sent from Moises Cortes from a recent auto show held in Isabela, Puerto Rico. The Blue 1967 looks great parked next to all that steel. Congratulations Moises on a great car and we hope the coming year brings many miles of happy motoring and plenty more chances to show off this beauty! The red '65 Corvette arrived in Australia and immediately received a shine, road tires, and a set of new plates with an Aussie touch, RUTE 66. The only thing that could outshine the car was the young sheila in the photo. 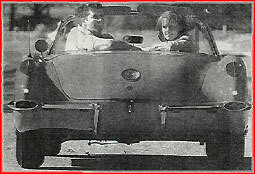 After a trip halfway around the world, the car was, in Karlo's own words, "twice as good as I expected." What a site, the great American sportscar traveling through the roads of Queensland. I'd like to be on that cruise. Elton had drooled over the ProTeam website for months before making the long trek to Ohio from Texas. He and his salesman, TC Cooley, spent a few days finding the right jewel to take back to Houston. He found a body-on restored '66 that fit like a glove. This car is ready for show or go. By the looks of the barn, there may be room for a few more horses... maybe a matching coupe to complete the set? Corvettes get lonely. 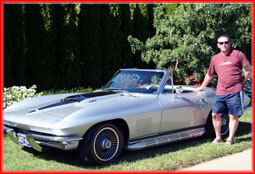 Mike has a designer's eye and a gearhead's passion for the Corvette hobby. A '54, '62, '78 pace car, and the fresh-paint black '57 are stars among this collection and all four spent some time in the ProTeam collection in less fashionable digs. Great cars deserve a great home and these cars have the best. Our hats off to you Mr. Brown! Although, I see an empty space but don't worry, we may have something that just might fill the bill. 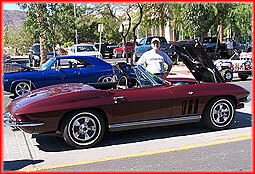 The Maroon '66 made it from ProTeam's showroom to the Super Run in Henderson, Nevada; which hosted over 1500 cars. The Corvette had a most productive day taking home an "Oustanding Vehicle" award. Curt said it was a great time. I'd bet my paycheck that the best part about Curt's day wasn't sitting in the sun waiting for the next judge in the hopes of winning a frameable certificate but getting behind the wheel and lighting it up and driving that '66 home. Vrooooom!!!! Tom McKeever showed his newly restored Silver '67 and it couldn't have been a finer day. 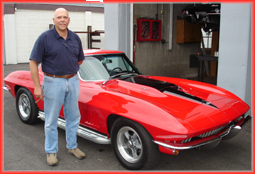 He came away with a NCRS Top Flight; scoring a 97.8 and another Corvette became part of a long list of award winning cars from ProTeam So is it true that Corvette owners resemble their cars? We think so, Tom has some silver of his own and would consider himself a big block. We would go one further and we'd give him a Top Flight too. 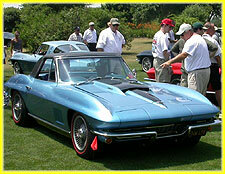 Dal Metzger's Corvette scored a Top Flight in the same show in Lancaster, Ohio. Dal's Red '67 scored a 97.4 and took home the coveted Top Flight. Congratulations Dal! Come back to ProTeam for a visit and bring your award winning Sting Ray. Also, Did Tom buy the first round since he got the higher score? 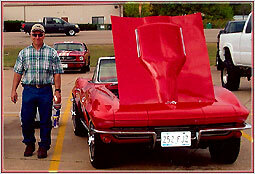 Roy stopped by ProTeam to show off the 1967 Big Block Coupe he purchased from ProTeam in 2004. Roy brought his Corvette from his home in New York. 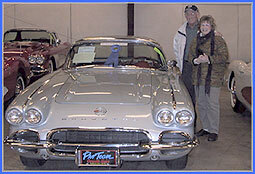 Roy took time to look at the ProTeam Corvette collection and catch up with his salesman TC Cooley. Not much out shines Roy outside of his '67. 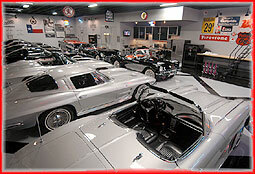 We love having old friends back at ProTeam telling new Corvette stories. This was a bare-bones-must-see-beyond-the-rust-and-crust-to-imagine-the-diamond-in-the-rough-project that is the car pictured to the left. 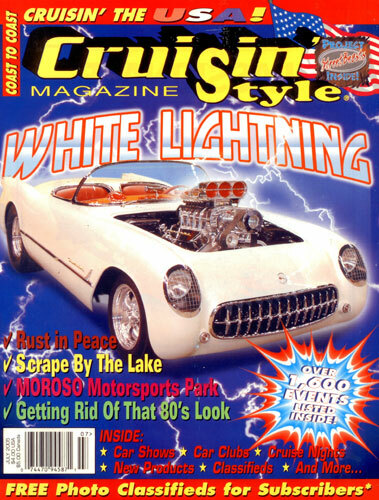 To see its Cruisin' Style cover debut, click on the image on the left. The Tackett's have built themselves a show-stopper. We have used many words to describe the restorations over the years but Cinderella on steroids comes to mind when referring to this transformation. Wow! 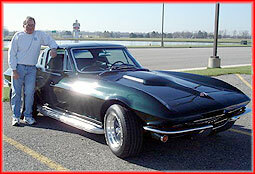 This '59 Red Corvette left ProTeam late December '05 arriving in Texas in time for one heck of a Christmas surprise. 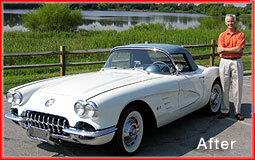 Debra was drawn to a ProTeam Corvette because of the selection of '59 Vettes. 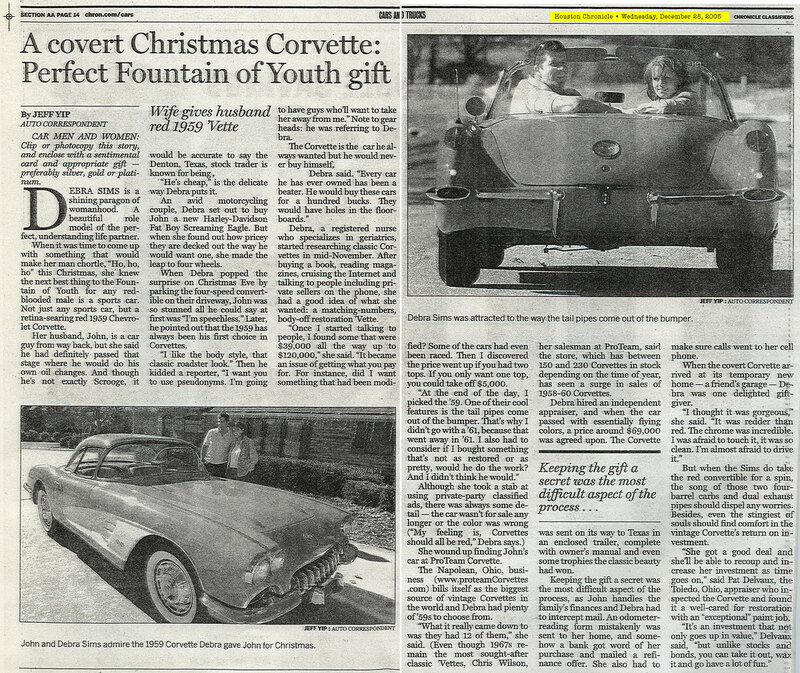 The gift was reported by Jeff Yip of the Houston Chronicle. Read Debra and John's entire story by clicking here. John is one lucky guy and Debra is one savvy shopper... Boy, I hope she gets my name in next year's gift exchange. 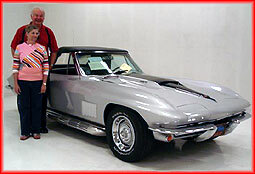 A picture that was a lifetime in the making was captured recently when the Rowles stood next to their "brand new" 1962 Corvette. No worries here as the biggest concern is making the right statement on the license plate. Drop us a line if you can help and we'll pass along your suggestion. 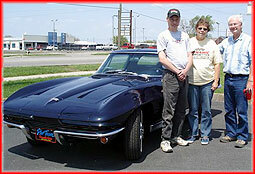 Click here or on the picture to see their high expectations for this car and their first 'Vette. As I've said, one Corvette is the beginning of a collection... and two is never the end! 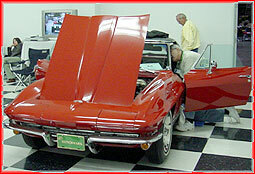 This Red 1965 Corvette drove off the ProTeam showroom floor late in '04 and it hasn't stopped turning heads since. 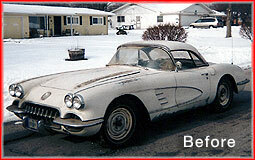 John and his son have completed a frame-off restoration of a '63 'Vette but John's ProTeam '65 is his driver. 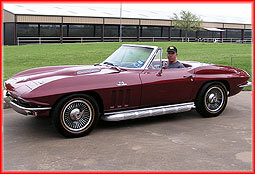 When John makes another trip from Texas back to Ohio, it will probably be in his Little Red Corvette. When it's time to buy another Corvette, he's betting it will be a ProTeam Corvette. We'll take that bet. Boy, we love it when old friends come back to town! 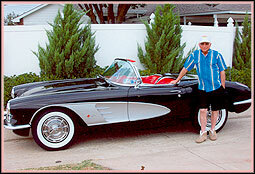 Bob poses with his 1959 Black Corvette outside his home in Colony, Texas. This Body-off restored darlin' left Napoleon this past summer and is enjoying retired life alongside its owner. Add one more photo to this car's history. Bob looks great wearing his limited edition ProTeam Corvette Hat! By the way, the car looks good too. 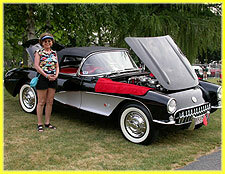 Clair & Pat Weidman's Black '57 struck Gold in June '05 and is pictured below but its garage roommate deserves equal billing. 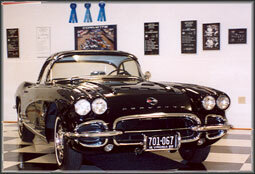 This Black 1962 Corvette was purchased in 2001 from ProTeam's Brian Topp. This car earned a Top Flight in 1997 and again in 2003. As if this car needed anymore pedigree, Zora Duntov's autograph is on the air cleaner. The Weidman's even have the photo of Zora signing it. Wow! A legend's signature on a legendary sportscar. 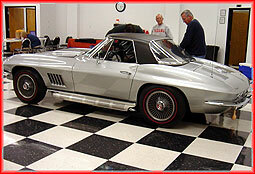 When this '58 Black/Red Corvette left ProTeam's showroom floor in August of 2001, it didn't travel far. Toledo, Ohio is 35 miles North East of Napoleon and in a ride this cool, it is a perfect cruising distance on an autumn afternoon. ProTeam's loss was Stephen's gain. 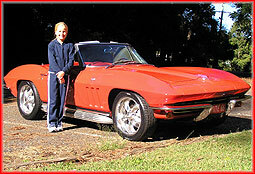 Claire Weidman has two loves in his life, his wife and their Corvette. 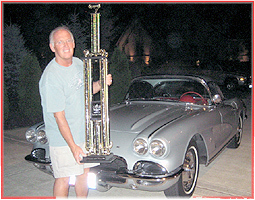 The '57 took home a Bloomington Gold at the 2005 edition of the summer classic. 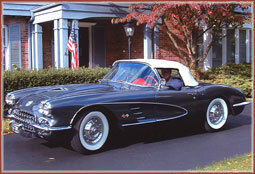 The Black/Red '57 Corvette is a former ProTeam charmer now cherished by Claire & Pat Weidman. When ProTeam owned this Corvette, we offered it as "unequivocally the real deal" and the judges at Bloomington Gold '05 concurred. Tom McKeever managed to receive Gold/Survivor/Benchmark with his Marina Blue Big Block '67 on the hot infield in St. Charles.